On Tuesday October 12, 2010 I gave birth to my first child, Emmett Russell. 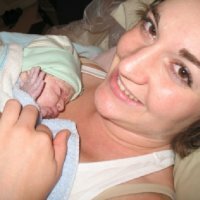 I had the exciting experience and privilege of spontaneously giving birth to my son in the comfort of my own home with the trusted care of my midwives at St. Jacobs Midwives. 38 weeks pregnant, I woke up Tuesday morning around 6:50 a.m. to use the washroom, and I immediately noticed I was wet and had a bloody show. I called Pooja (my second midwife) about my concern and I preceded to text my sister to let her know that we might have to cancel our 10 a.m. workout date. I was working as an administrative assistant at the time so I called to let them know that I wouldn’t be in to work that day (I was supposed to work until Friday). My husband, Russ, called into work to inform them that he would work from home in case my labour progressed. I had a late morning nap after having breakfast (around 10:30 a.m.). I still did not have any contractions yet but felt yucky (like you might feel on the first day of your period). At 12:30 p.m. my sister came over for lunch and surprised me flowers. We hung out, chatted, and had some raspberry leaf tea while sitting on the front porch. It was nice to have someone to talk to as I was feeling a little nervous. I had a couple contractions in the early afternoon but they were manageable (like strong period cramps – I spent some of them in the bathroom). I laid down on the couch for another nap around 3:00 p.m. (Lana told me to try and get lots of rest because she thought I might be in labour through the night). I woke up from my nap at 3:45 p.m. with a VERY big contraction that lasted 5 minutes. I called out for Russ (he was working in our office upstairs) and he ran downstairs. He was on a conference call and had to put it on mute to help me through the contraction. (I rolled to my hands and knees, hunched over beside the couch). Contractions from now on came on strong and were very consistent. (approximately every 3-5 minutes and 30 seconds to 1 minute long). I called to see if my sister could come back over to help me finish packing my hospital bag. (At this point I still thought that I would eventually head to the hospital). She was not home so my brother said he’d come and help. I sent him on a whirlwind of errands for things that I ‘thought’ I needed but in hindsight just laugh about! (e.g. mini speakers for my iPod that I thought I left at work, and a specific black tank top which I thought I desperately needed) At this point I was also working on making the post partum bath on the stove that my midwives had given me (pausing through contractions as they came). Since contractions were coming very fast, Russ called Lana around 4:30 p.m. She asked if I wanted to meet her at the hospital but I said that I did not want to drive in the van because the contractions were coming so quick and were very uncomfortable. (I couldn’t imagine trying to ‘sit’ in the van all the way to the hospital, and I wanted to see Lana before going to the hospital) I handled my contractions the best by being on my hands and knees either by the couch, on the floor, or by the bed and with Russ pushing my hips together firmly. I had a very large contraction in the living room around 4:45 p.m. and experienced a huge gush of water and started to get very anxious for Lana to arrive. Things were very intense at this point and much more painful. She immediately called my second midwife and Pooja arrived within 5 minutes! She brought in her back-up gear very quickly and as soon as she arrived, I started pushing. Russ was on my one side and Pooja on the other. My mom arrived just in time (I wanted to have her at the birth and she was just getting off her shift at work). She took Pooja’s place beside me. (I had no idea, but apparently Russ was running up and down the stairs in between contractions getting things like water, a bowl, figuring out the thermostat. All I remember is that he was right beside me every time I called his name). I followed my midwives’ instructions and tried to focus my energy. I remember being very thirsty between pushing and feeling a bit of a ‘break’ between each push. My midwives helped to control the baby’s head so I didn’t tear very much. My body naturally got a ‘wave’ of energy so I knew when a contraction was coming and when it was time to push. Emmett was born at 5:44 p.m. on my own bed in my own home…drug free!! He was 5 lb 11.5 oz. They put him on my tummy, and Russ and I were in awe. I noticed that he was a boy! (we did not find out the gender prior). I honestly felt like Wonder Woman! Lana and Pooja cleaned up everything, drew an herbal bath for Emmett and me, and helped me to nurse Emmett for the first time. Our midwives took good care of us, helping us through our first steps as parents! I was in excellent hands with my midwives and although very emotional, exhausting, and intense…my experience was very positive!